We started selling Sakura Bloom Ring Slings after Cheyenne talked me into it at our first ABC trade expo event in 2011. She had one in her personal stash and swore to me that people would love them. I had hired her for her babywearing expertise, so we placed our first order. I let her choose the colors and styles. She included one silk in with the rest being linen in our first order. The linen slings sold well from the beginning. Here in Texas, linen is a nice light weight cool option in the heat of our brutal summers. They are quick to use. And affordable. That poor silk sat for so long. In 2013, Sakura Bloom had a booth at Dallas Market. It was a quiet market that year, and we got to spend a lot of quality time with the owners, Lynne and Eric. And we complained to them that while we had no trouble selling linen slings, we could not see the benefit of the more expensive silks. Lynne pointed out to us that silk was actually cooler than linen to wear in the heat. That it would breath better and was far more supportive. Armed with new knowledge, we came back and were able to tell our customers the benefits of silk. And that is why you see so many glorious silk ring slings in the Nappy Shoppe community. We also came back having formed a new friendship. One of the high lights of our trips to the ABC trade each year is visiting with Lynne and Eric. They are a fun friendly, down to earth couple. They care about their business and their retailers. Unlike some manufacturers, they care about the value of their brand. Sakura Bloom is one of the best selling brands in our store. It is not hard for this to be the case with a quality product, and a manufacturer who we consider a friend. History of Sakura Bloom Ring Slings. Lynne's sister, Carole, is an anthropologist. She was studying South east Asia traveling to India and Nepal a lot. As Carole was pregnant at the time, she was fascinated with how babies were carried in these countries. They used carriers out of necessity, something that back in 2005 she did not see happen here much. She joined thebabywearer.com, which at the time was a small community of women wearing and many making their own carriers. There were virtually no stores. 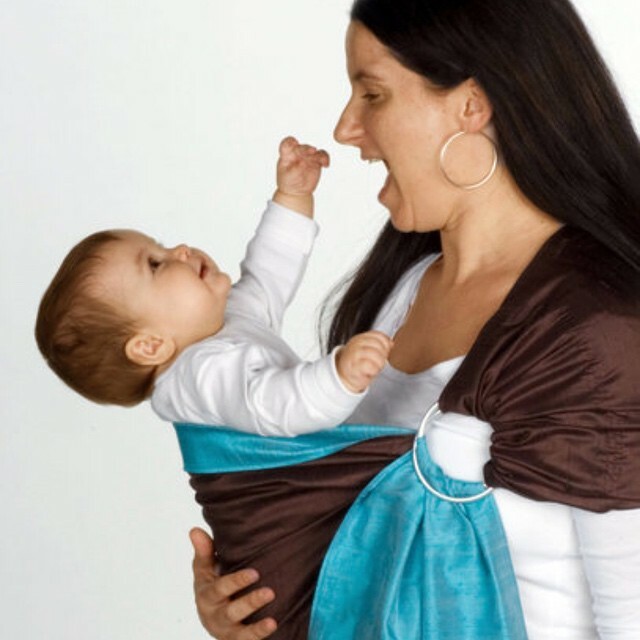 Lynne and her baby daughter Teja in one of the original ring slings. When Lynne got pregnant with her daughter Teja in 2005, Carole gave her 5 different carriers to try. First off she started with a pouch style. Lynne says she cringes to think of how she wore Teja back then. She is not alone, I was the same with Braden. Little did we know. It was all a learning time. At 6 months of age, Teja did want to be cradled any more, she wanted to be upright and sit. So Lynne pulled out the silk ring sling that her sister had given her. She fell in love with this carrier. When a friend of Lynne's in London got pregnant, she asked her sister where to buy a ring sling the same as what she was using. The answer was, no one makes these! Lynne enlisted the aid of her seamstress mother, and with different colored silks, made another ring sling. Lynne continued to sew the ring slings. Have fun with different colored fabrics. She sent one to her sister. 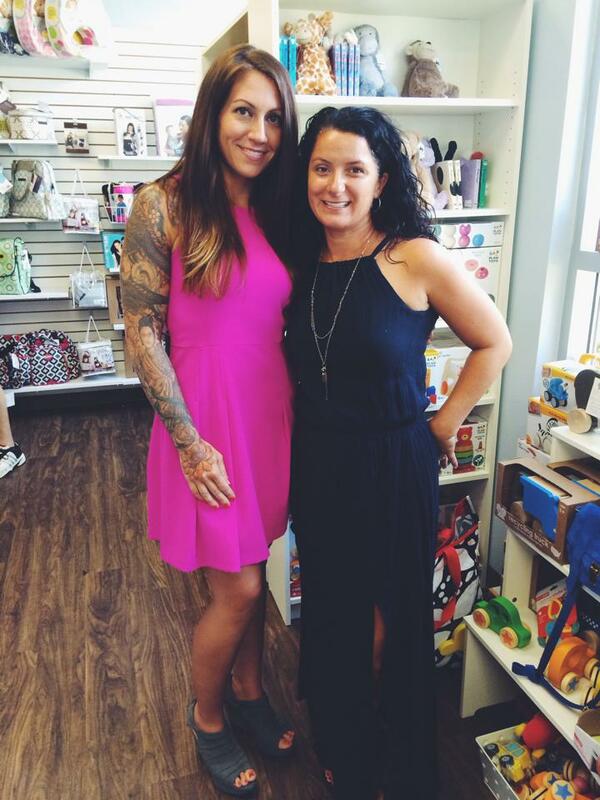 Her sister was wearing her baby in it, when she visited a baby boutique in Colorado. The owner wanted them for her store. So Lynne was asked to make more ring slings. So she made 10. It was 2006. At this point there was no plans for a business, but it soon became obvious that was to become one, so in 2007 Sakura Bloom was born. From the beginning, Lynne knew she wanted her business to be sustainable. She watched women start carrier businesses and go out of business soon after when they did not price their products high enough to cover costs etc. So Lynne did her research on pricing, and priced her slings for her business to survive. She also learned the importance of keeping brand value, and as such rarely discounts. Eric and baby Jai 2008. At first Lynne did all the sewing. But soon it was obvious that she could not do it alone. She was introduced to a bridal shop seamstress called Amelia. Amelia was from Italy, and after critiquing Lynne's sewing technique came up with a higher quality product. For the first three years of business, Amelia did it all from her basement, including shipping. In 2010, it was too much, and Amelia needed to move on. So Lynne found a factory in the small industrial town of Fall River, in Massachusetts. And that is where Sakura Bloom is still manufactured. Lynne with Eric and the kids. In 2012 Lynne could not continue to administrate the business alone, so her husband Eric, came on board full time. Lynne found that they did not need to live near where the slings were produced. As long as they had their laptops, and internet access, they could run their business. They now have three employees. Leigh in market (and so much more), Jill who does social media (she is the pregnant voice behind Instagram), and Tiffany in customer service and manages wholesale. 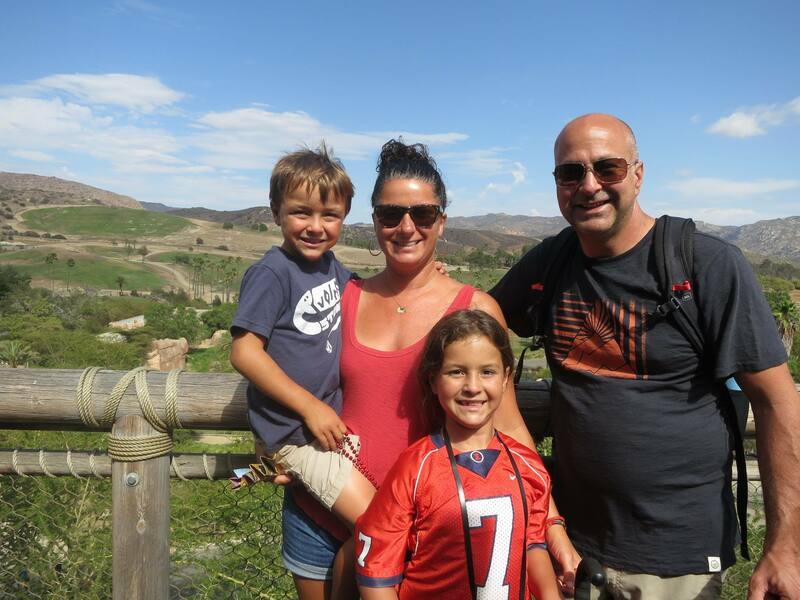 Lynne lives in California with her husband Eric, and two children, Teja 9 and Jai 7. And here is a little tidbit for you, Lynne and Robyn of BabyHawk are very close friends, and Robyn lives in California too. A pinch me moment, for sure. 9 years ago these were my fingers pushing layers of gorgeous, vibrant silks under the foot of my grandmother's old tabletop singer sewing machine. When my daughter, Teja, was born in 2005, babywearing wasn't a household term and it was next to impossible to find unique, different styles of baby carriers in local stores. Big box stores were the only option for most people, and they offered pretty much one style of carrier and definitely nothing made locally. I didn't shop in big box stores for myself and I didn't want to start with my baby. I wanted to support small, local, family run businesses like ours. 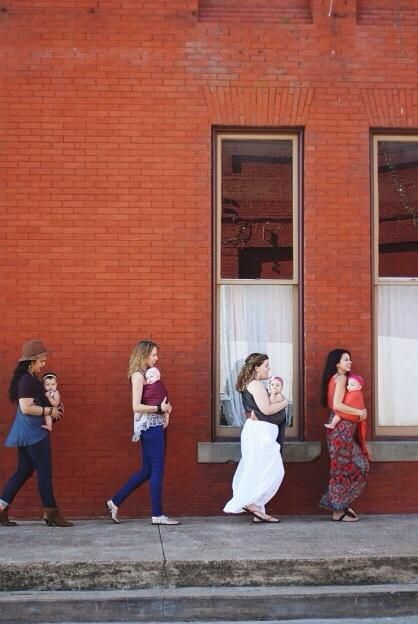 So, I made it my mission to try and bring the amazingness of babywearing to the boutiques dotting our downtowns. When I was pregnant I would drive over an hour from our house in MA to the cutest little boutique in CT that sold cloth diapers just to see the colors and be able to talk with someone about what we would need or want. I knew I wanted people to be able to do the same with our slings. Feel the textiles. Try the sling on. Shop Locally. That boutique became one of our very first retailers ❤️ Papaya Patch in West Hartford, CT. Today we have 300 small, local, independent retailers (mostly women owned!